was at the excellent cosmonauts exhibition at the science museum today. among all the marvels, the thing that gave me the chills was the LK-3 lunar lander - the soviet equivalent of the US lunar module. 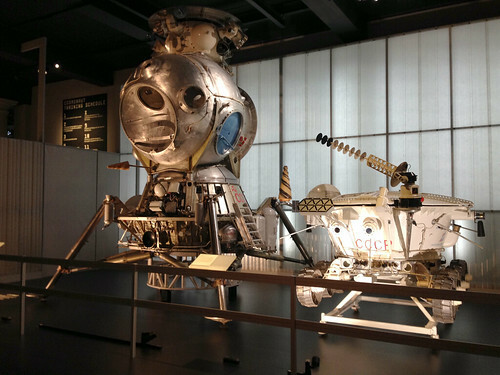 it was like looking at an alternate history - if things had worked out a little differently, alexei leonov might have stepped out of one of these to be the first man on the moon. as it was, the whole project remained a secret until the 1990s. valentina tereshkova had a capsule all to herself - quite spacious. three men were subsequently packed into the same size capsule. judging by their seats, they were the size of petite japanese women. leonov had difficulties getting back in after his spacewalk, but the film footage shows he had difficulties getting out of the cramped spacecraft, too. the 1980s-2000s space station technical clothing would be quite plausible as a set of costumes worn in concert by david bowie as ziggy stardust. except for the one that is exactly 'the wrong trousers' of wallace and gromit, complete with 'braces' and control box. nick park must have seen a picture. in reality it's designed to pull blood back into the lower limbs to ready them for descent into earth's gravity again.